Want to save time at the airport? Volunteer for that voucher when they oversell? Hop on an earlier flight? Easy with a carry-on, otherwise difficult when you are tethered to your checked bag. After a lot of research, we use the TravelPro Expandable Rollaboard for long trips and the Samsonite Wheeled Under-seater (fits under the seat in front of you) for short trips. Here's how to pack a surprising amount into a small space and always keep your bag with you. No joke, you can fit lots of clothes in your bag when you roll your clothes. It's magic, and it often prevents wrinkles too! 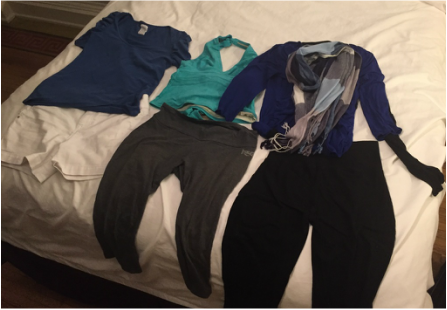 Check out my packing list and remember the golden rule, less is more. Pack in neutral, coordinating colors that allow you to easily mix and match, add and remove layers. Don't pack black and brown, pick one! Personally, I like black as a base with shades of grey and blue. When you lay out clothing options, make sure you can wear an article of clothing in multiple variations, dress it up or dress it down. Bonus tip: Pack a scarf! It's a versatile layer: i.e. a shawl for the evening, sarong for the beach, even a pillow for the plane! 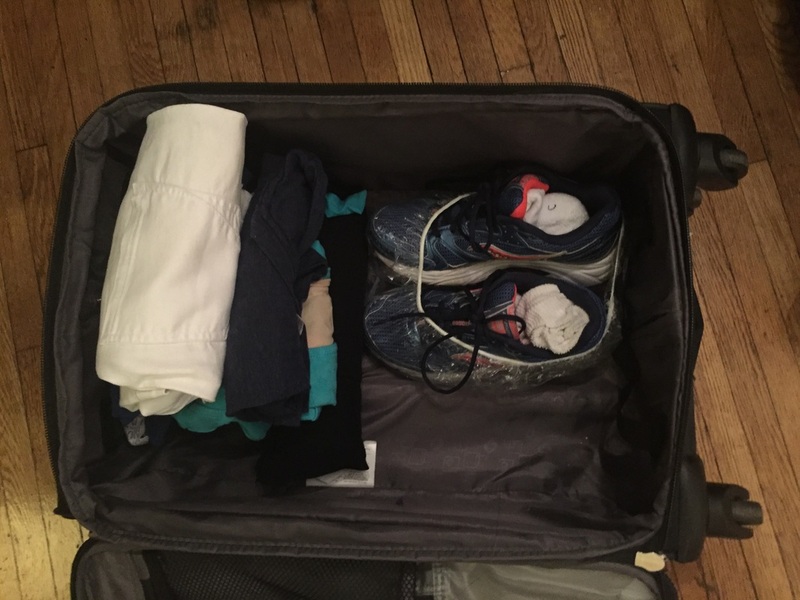 Shoes take up a ton of space in your carry-on, so they are the most important thing to minimize. 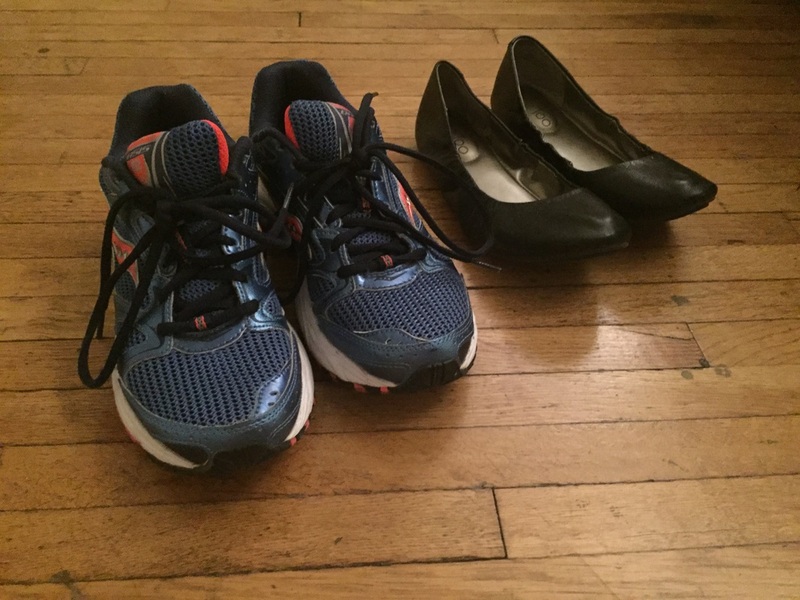 With few exceptions, you should only pack 2 pairs of shoes when you travel. Wear one, pack the other. You'll spend 90% of your time in the most comfortable shoes to walk in (boots, sneakers, flats or even sandals) and only 10% of the time in the other shoes. Choose wisely on both counts, and ideally both pairs are easy to walk in and can be dressed up or down. Bonus Trip: I pack my pair of shoes in a plastic bag or shower cap (they often have these at hotels) so the shoe bottoms don't sully clothes. Pack an empty tote bag inside your carry-on. This allows you to go there light, come back with souvenirs if you choose. Airlines allow 1 carry-on bag as well as a "personal item" which can be a small purse or a full tote bag. Remember, there are laundromats and hotel laundry services all over the world! When taking a long trip, just bring a laundry bag for your dirty clothes and some detergent pods that are easy to pack. 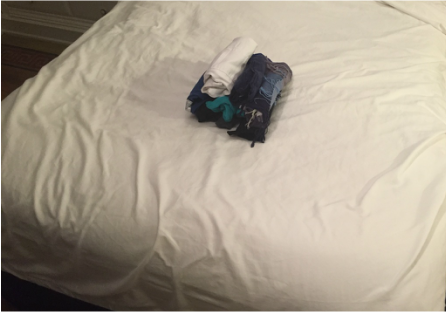 Mid-way through your trip you'll have fresh clothes without having to pack like you're moving there! ​Bonus tip: Dryer sheets also keep your dirty clothes smelling good in the laundry bag in your suitcase. Pack make-up and specialty toiletries in small travel-size containers, but generic supplies like sunscreen and shampoo are things you can easily buy once you land (often at the airports for convenience). Hair dryers especially should be bought overseas as the high voltage often does not work with plug adapters. Bonus tip: a bit of Saran wrap over the lids of your toiletries before you screw the cap on keeps them from spilling! Planes are cold. Even if you are going somewhere tropical, wear your warmest layer when you travel. It'll save space and keep you warm in the plane. Downloading books, magazines and videos to your phone or tablet. Amazon Video app lets you download up to 25 programs on your phone to watch offline. Remember, even if you pay for in-flight internet, they don't let you stream YouTube, Hulu or Netflix due to bandwidth. Download Google Maps to your phone so you can access maps offline without carrying maps or guides. This is especially important if you plan on being in wifi-mode when traveling. Take pictures of your passport and travel documents (and email them password-protected) so you can always access them remotely.